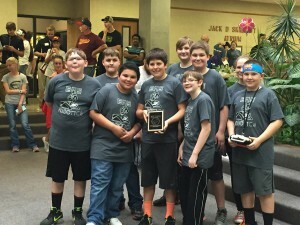 The Emporia Middle School Tetrix robotics team placed fourth at the Tetrix Robotics Meet April 26 at Emporia State University. The team averaged 512 points per game. The EMS team also won the award for best design and strategy, according to Laura Albertson, EMS gifted services teachers. Students competed against 22 teams from surrounding schools. Members of the EMS squad include 8th graders: Jacob Stutler, Caleb Schmid, Kaitlyn Sperka, and Derek Bair. 7th grader: Lucas DeJesus, and 6th graders: Roman Aguilar, Garland Hamlin, Dakota Goza, and Aidan Herring. The team is coached by Amanda Schild, EMS 8th grade science and STEM instructor and Gage Saltkill, ESU student volunteer. The team is sponsored by the EMS Junior Spartan X-tra after school program.